Submitted by JoeKeresztury on Sun, 10/19/2014 - 04:40. Definition of a Garage: A garage is defined as a space for parking motor vehicles that is closed off from the outdoors on at least 3 sides. Typically it has an overhead door. A carport is a space for parking motor vehicles that is open to the outdoors on at least 2 sides. Garages or carports can be attached to, or detached from, the living area. Garage separation requirements normally do not apply to carports. 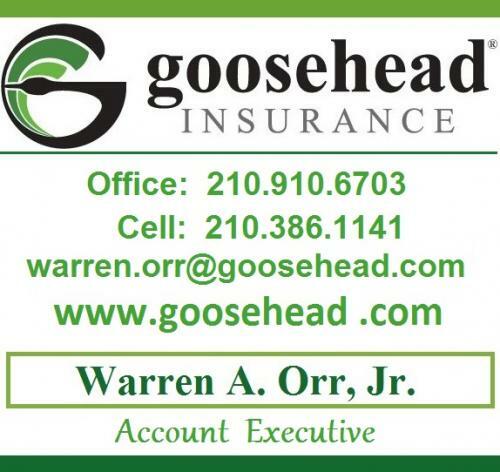 Safety in your San Antonio area Homes Garage should always be a concern. 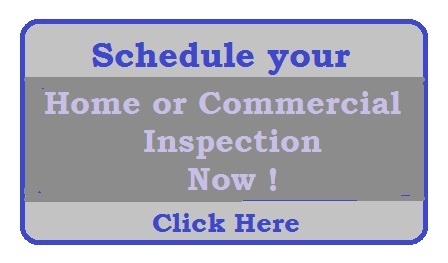 We are going to review garage safety requirements and suggestions in this article. 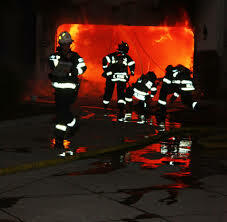 Many fires start in garages. 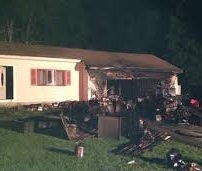 Unfortunately fires that start in garages usually are more intense than fires that start elsewhere due to the presence of gasoline, gas appliances, cardboard boxes, newspapers and other stored flammable items. 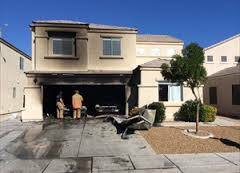 Fires that begin in attached garages to a home are more likely to spread to living areas than fires that originate from detached garages or open carports that are not attached to a home. 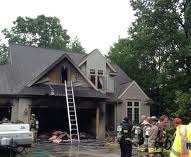 For this reason, combined with the multitude of possible flammable materials commonly found in garages, attached garages should be adequately sealed from living areas for safety purposes to help prevent or slow the spreading of garage fires into the living area of the home. Why do Garages have fire hazard safety concerns? 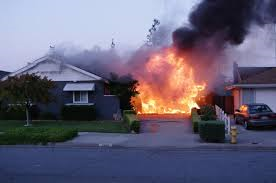 Flammable liquids, such as gasoline, oil, paint and paint thinner are commonly stored in garages. Other examples include: brake fluid, degreaser, motor oil, varnish, lighter fluid, and other fluids containing certain solvents. Many chemicals are flammable in their fluid form, and some may create explosive vapors. Oil or gasoline can drip from cars. These fluids may collect unnoticed and eventually ignite. Car batteries can spark under certain conditions. 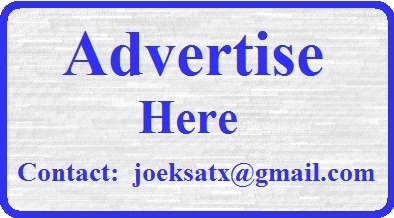 Water Heaters which are frequently installed in garages in the South Texas and San Antonio area with or without gas supply (some are electric) can create sparks that can ignite fumes or fluids. Storing flammable materials by water heaters can be hazardous. Many projects by homeowners or hired tradesmen, including mechanical or electrical are usually undertaken in a garage. Fires can easily start while careless individuals are near flammable materials when doing certain type projects, repairs, etc. 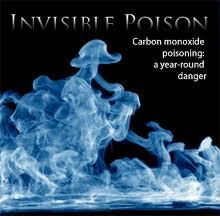 Why are Garages a carbon monoxide safety hazard? Sources of carbon monoxide (CO) problems in a garage include: Back-drafting from Gas water heaters, Furnaces, Automobile exhaust, Generators and other gasoline powered equipment. Dangerous situations can occur when carbon monoxide is trapped in contained spaces that are poorly ventilated such as a garage. A car engine running in a closed garage can cause CO to build up to fatal levels. 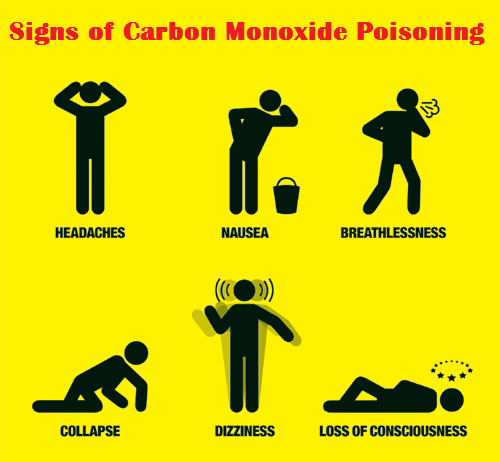 If there is too much carbon monoxide in the air you are breathing, your ability to absorb oxygen can be diminished, resulting in serious tissue damage. Making sure you know how to use fuel burning appliances correctly (water heaters, etc. 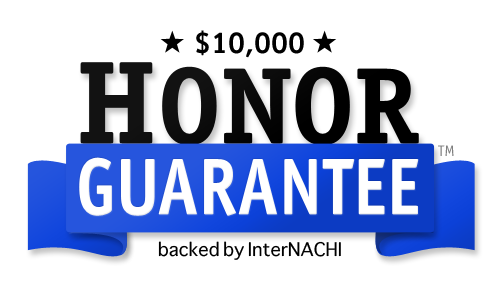 ), have sufficient ventilation, take specific safety precautions and get fuel burning appliances professionally inspected once a year. In an attached garage, even if the overhead garage door is open, do not leave your car running. Do not operate a portable generator or any other gasoline engine powered tools or equipment in or near the garage even if doors and windows are open. Use portable generators outside only, far away from the home. Check to see that your appliances in the garage (water heaters – furnaces) are properly installed and comply with building codes and manufacturer's instructions. Qualified professionals should properly install appliances. 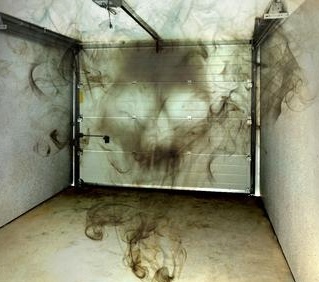 Do not use charcoal inside your garage, (or house, vehicle or tent). In the garage make sure there are fresh air vents at an exterior wall. You should have a minimum 2 – 8x16” fresh air vents for up to a 2 car garage and 3 vents for a 3 car garage, etc. Openings from a private garage directly into a room used for sleeping purposes shall not be permitted. Other openings between the garage and the residence shall be equipped with solid wood doors not less than 1-7/8” in thickness, solid- or honeycomb-core steel doors not less than 1-3/8” (35 mm) thick, or 20-minute fire-rated doors. Doors should have tight seals (air tight) around their joints to prevent seepage of fumes into the living areas of the house. 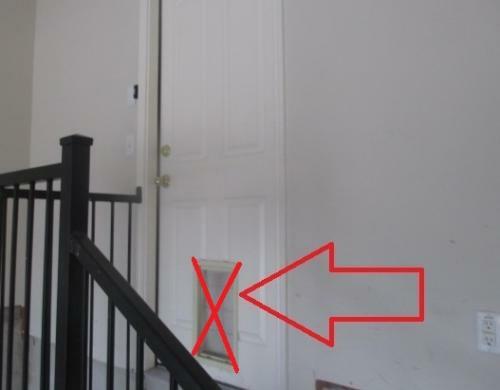 Carbon monoxide, with the same approximate density as air (and often warmer than surrounding air), will easily rise above the base of an elevated door and leak through unsealed joints. Doors should be self-closing. Many homeowners find these doors inconvenient, but they are safer than doors that can be left ajar. 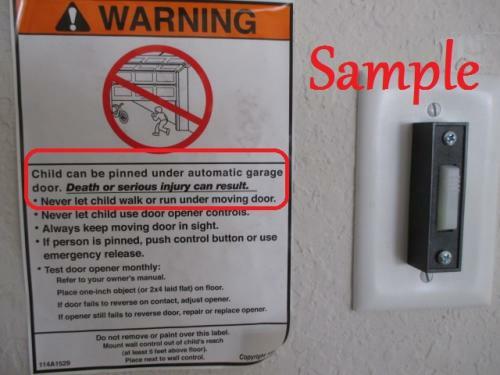 Your garage door to house should have an auto door closer mechanism as required by the IRC (see sample) on the door from the garage to the living area of house. It is helpful if there is at least one step leading up to the door from the garage (Garage lower than the living area). Gasoline fumes and other explosive gases are heavier than air, and they will accumulate at ground level. Their entry beneath a door will be slowed by an elevation increase. 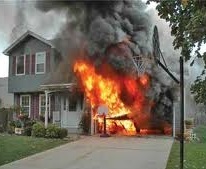 If doors to the house from garage have windows, the glass should be fire-rated. The garage shall be separated from the residence and its attic area by not less than ½-inch (12.7 mm) gypsum board applied to the garage side. Garages beneath habitable rooms shall be separated from all habitable rooms above by not less than 5/8-inch (15.9 mm) Type X gypsum board or equivalent. Where the separation is a floor-ceiling assembly, the structure supporting the separation shall also be protected by not less than ½-inch (12.7 mm) gypsum board or equivalent. Garages located less than 3 feet (914 mm) from a dwelling unit on the same lot shall be protected with not less than 1/2–inch (12.7 mm) gypsum board applied to the interior side of exterior walls that are within this area. Openings in these walls shall be regulated by Section 309.1. 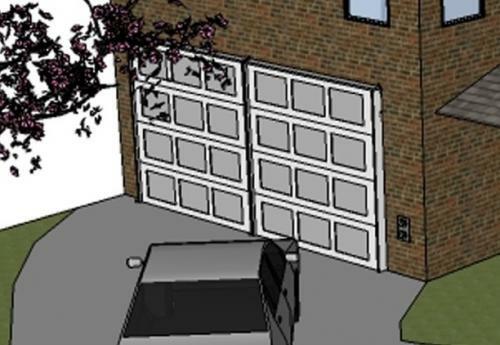 This provision does not apply to garage walls that are perpendicular to the adjacent dwelling unit wall. Drywall joints shall be taped or sealed. Joints shall be fitted so that the gap is no more than 1/20-inch with joints backed by either solid wood or another layer of drywall such that the joints are staggered. Penetrations between the garage and house such as for pipes, electrical and ducts should be sealed with a fire resistant foam or caulk to resist flow of fire and smoke. Maintain the same fire separation for drywall penetrations, such as at scuttle holes, pull down attic ladders, gas vents and plumbing pipes as provided by the sheetrock (gypsum drywall). In garages that have access to the attic, a hatch cover made from an approved, fire-rated material should protect this access at all times. 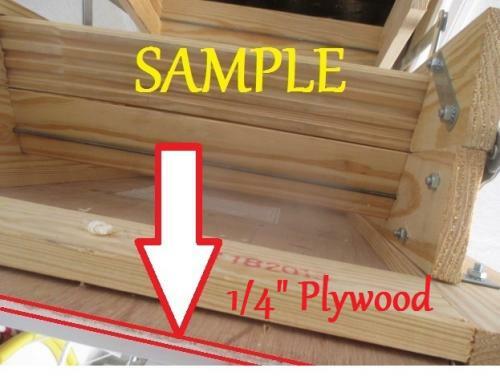 Missing or opened covers should be avoided, as should covers made from flammable materials, such as thin plywood as shown in sample. 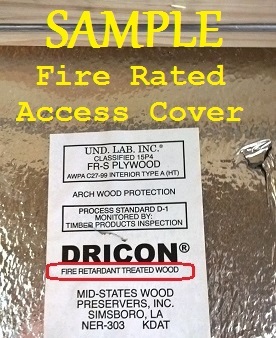 Plywood covers with the standard attic access ladders as shown with a 1/4" veneer do not maintain fire separation as needed. In garages that have the access to the attic, a hatch cover made from an approved, fire-rated material should protect this access at all times. 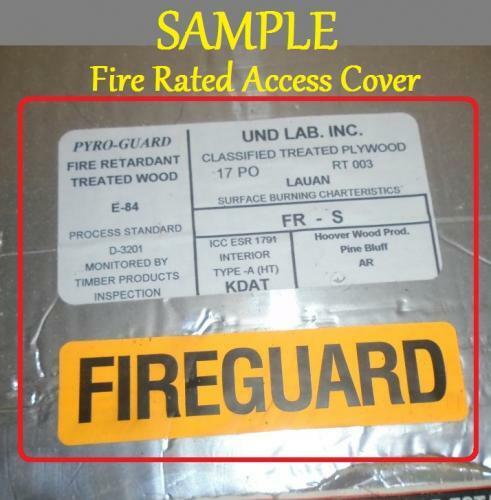 Samples show fire rated access covers. For required fire separation purposes ½” sheetrock is required on the entire garage ceiling for common attic area separation. Having the access opening in the ceiling (w/ ¼ plywood cover - see sample above) voids the required seal of separation. 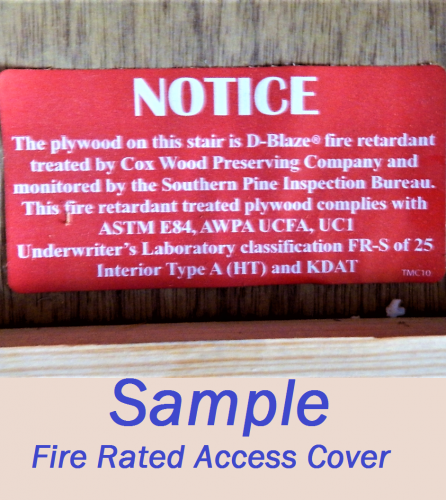 Plywood covers with the standard attic access ladders do not maintain fire separation as needed. Garage attic doors must be constructed such that the 45 minute rating is maintained; any drywall edges on both the hatch and the surrounding area exposed to physical damage are protected. The cover or door is installed so that it is permanent (non removable) with hardware to maintain it in a closed position with latching hardware to maintain it in a closed position. This could be accomplished by the use of spring loaded hinges, door closer, or hardware that will not allow it to be left in an open position when not in use. Ducts in the garage and ducts penetrating the walls or ceilings separating the dwelling from the garage shall be constructed of a minimum No. 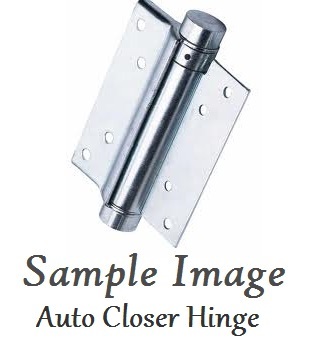 26 gauge (0.48 mm) steel sheet or other approved material, and shall have no openings in the garage. Dryer exhaust ducts that penetrate garage walls are serious fire hazards. These ducts are generally made from plastic and will easily melt during a fire, creating a large breach in the firewall. 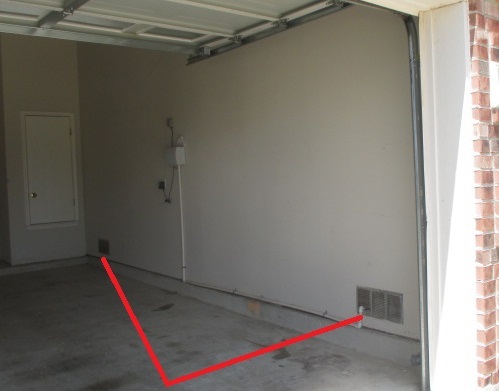 A curb (garage dropped) should be present along the perimeter of the garage floor. This curb is designed to prevent fluids from entering the living areas of the house. 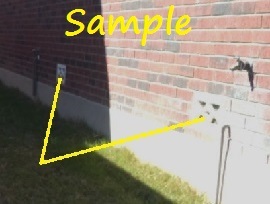 Curbs are often useful barriers against all moistures and the curb will keep chemical spills contained in the garage. Gas water heaters and furnaces in the garage should be properly vented. All flammable liquids should be stored in clearly labeled, self-closing containers, and in small amounts. 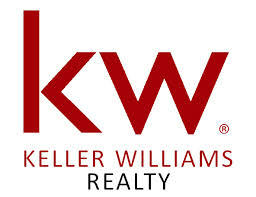 They should be stored away from water heaters, appliances, pilot lights and other sources of heat and flame. The floor should be clear of clutter. Loose papers, matches, oily rags, and other flammable items are dangerous if they are strewn about the garage floor. Keep all storage and clutter away from water heaters. The above photos show fires that started in the garage but were able to be contained in the garage most likely due partly or totally to proper fire safety requirements being established and maintained in the garage area. 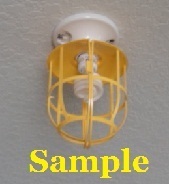 If light fixtures have exposed, unprotected light bulbs use birdcage cover protection. In summary, garages should be properly sealed off from the living area of the home so that fire, gas vapors or carbon monoxide can be contained.